We did the first Market Analysis last September, and a second one in March. We will continue to do this every 6 months and try to make it better with your feedback (so feel free to send suggestions or corrections to bob.bickel at runsignup.com). We do this as part of our own internal market evaluation processes, but share it since there does not seem to be a good source of information like this. Last year, we also added our thoughts on Race Registration Market Trends and Race Registration Company Valuations. These are largely the same – and the trends in the data seem to confirm our earlier thoughts. It is tough to estimate market share since there is no one place that has ALL races, and races are open for only part of a year, and different vendors have different search tools for finding races, so we took several approaches to looking at things. RunSignUp has been very public about sharing our numbers. You can read our Year End Report for 2015 to see that we had over 10,000 races use us to process 2.7 Million paid registrations in 2015. The trend continues positively – and we are estimating over 14,000 races processing registrations on RunSignUp and 4.3 Million paid (not including imported) registrations in 2016. 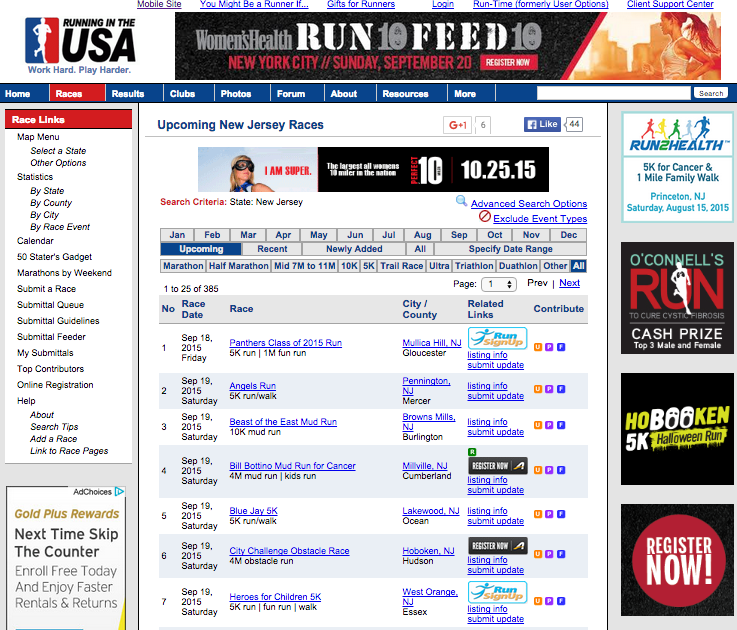 RunningintheUSA.com is the largest calendar of race sites in the US with 49,749 races listed. They use Active.com’s, RunSignUp’s, and Race Entry’s automated API to load races from each of us – that is why you see the little logos for each of us on the calendar. This probably means that we are unfairly represented as they do not get every race from every other of the 100+ registration providers in the market. We increased the sample size this time from 500 to 1,000 races to increase accuracy of this estimate. RunSignUp will be used by over 14,000 races this year for processing their registrations, which is 26% of the races in RunningintheUSA, so those numbers are probably fairly accurate for RunSignUp. There are over 100 registration systems, and not all of them have race listings. For example we could not find a list of Chronotrack Live races, but know from their public statements that they processed over 1 million registrations in the first half of last year. Likewise, IMAthlete is much stronger than this list shows because of a number of large events they provide registration for like the LA and Philadelphia Marathons. In addition, the search tools may include non-endurance race events in some cases (for example Events.com mixes a lot of different types of events and there is no advanced search filter). And search methods change from period to period – for example RaceIt introduced a much better race search, which allowed for a better count of races on RaceIt. Active changed their search criteria as well so it is difficult to get the US market only. We actually went thru each page and used the “Active Advantage” as a general flag meaning registration was on Active (although that is not always the case). We did a rough estimate based on the US only and looking at the number of pages for weekend days. For example we counted pages 122-157 for Oct. 1 and multiplied by the 12 events per page. We eliminated events marked with “Various Dates” since many of them were clubs or continual training programs. And final caveat to this data is that some race calendars may include races that do not have registration on their sites (the RunSignUp data is accurate since we have a search flag internally we can use to look for races that are open for registration on RunSignUp). We also started tracking Turkey Trots. This year we also changed the way we counted the Active and RunSignUp races – doing the count based on doing a hand count of races on Nov. 24 on RunningintheUSA. For other providers we just used a manual count from their race calendars. Alexa is a cool tool that shows the ranking of websites based on page views. It is approximate, but is fairly accurate. As above, there are lots of caveats to this. For example not all registrations may come to that site – for example we think RaceIt is still the registration platform for RocknRoll races, but those are probably not processed on the RaceIt.com website. Also note that EventBrite, Active and Events.com all are covering much more than the endurance market and their numbers are inclusive of those other markets. Note also that early September is a lower volume time than late March to collect this data because there are more races happening at that time and more large races having more registration activity across the board. So some negative growth is expected. If there is positive growth, then it indicates there is probably more growth in the business. To put some context on these numbers, RunSignUp is doing about 2.5 Million Page Views per week now to get in the Top 5,000 sites. In September last year, we were doing 1.8 Million Page Views to rank about 7,500. As further context, another company Bob is on the board of has a page rank of 35,064 and has 265,000 visitors per week for about 750,000 page views. Our objective in doing this was trying to understand how far we had gotten with our growth. We are guessing that we are at about 12% market share with our 4.4 M paid registrations in 2016 – assuming there are about 40 Million Paid Registrations in the US. We are really proud of the impact we are having on the endurance and race market. Especially since RunSignUp is a lot more than registration, as we have a number of other offerings. The Race Director helps Timers score and provide results for over 11,000,000 participants annually. RD Go, our Cloud based Scoring and Results system used by Timers and Races hosts results for over 5,000 races and sends tens of thousands of result notifications each weekend. RaceJoy is by far the leading race GPS Tracking solution in the market. RunSignUp for Clubs is used by hundreds of clubs to help with membership management and tie to races. And our free services like Volunteer Management, Check-In App, Race Calendar Widgets are used by many races beyond those who do registration with us.